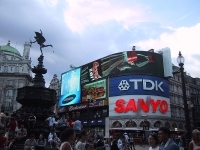 Surrounded by neon advertising and fast-food restaurants, Piccadilly Circus is London's answer to New York's Times Square and, at the junction of Piccadilly, Regent Street and Shaftesbury Avenue, it is the gateway to the West End. With its highly accessible tube station, Piccadilly Circus is a good starting point for those wanting to enjoy London's finest shopping district, being near to Jermyn Street, Saville Row, Regent Street and Bond Street. London's Theatreland is centred on nearby Shaftsbury Avenue, and Soho and China Town are also within easy walking distance. Piccadilly Circus is one of London's meeting points, an atmospheric hub conveniently providing access to a number of famous attractions and streets.